Upcoming property series Unreal Estate now has a new airdate after being rescheduled by Nine. 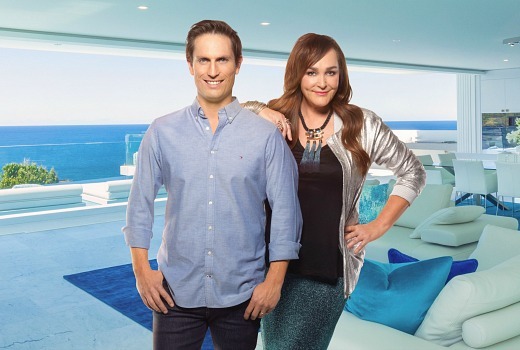 Hosted by Kate Langbroek and Cam Knight, peeks into luxurious properties and meets their owners from Tuesday, September 27 at 8.40pm. “It’s the ultimate open-for-inspection, really, without having to worry about doing a runner when the real estate agent realises you can’t pay for the property,” says Langbroek. “I was like a little kid let loose in a candy store. It was so much fun to visit these incredible homes and take up residency, even if only for a day or two,” says Knight. Kate and Cam take viewers on a tour of unreal extravagance through rare and state-of-the-art properties, and meet the extraordinary people who own them and the dedicated staff they entrust to keep these lavish homes running. Kate and Cam explore everything from Queensland’s most expensive home, with his and hers helipads, to a rotating house where the view changes with every turn; a rainforest retreat complete with a private disco; an extravagant French Chateau in the Victorian countryside; a seven-level beach house inspired by a whale; Sydney’s most extravagant reno – and stunning weekend retreats where the rich and famous go to get away. 8:40pm Tuesday September 27 on Nine. You’ve given the wrong date for when it’s on, cos it just can’t be so. Shame it’s Kate Langbroek hosting, she’s someone I can only handle in small doses.